Two researchers, Mark Graham and Stefano De Stabbata, at the Oxford Internet Institute have depicted the world’s “Internet empires” in a map, below. 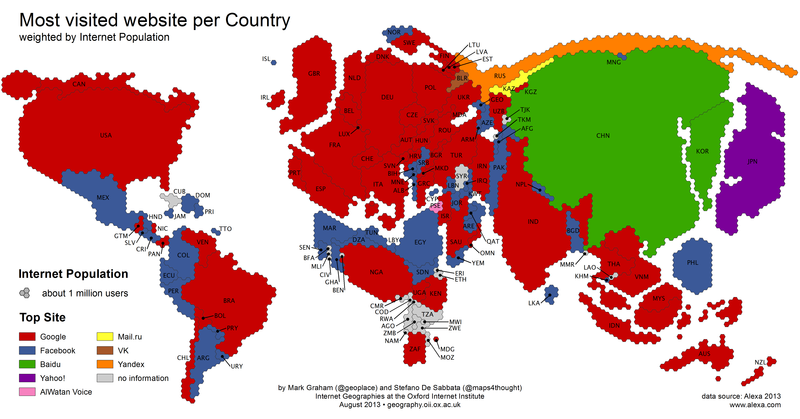 The map shows each nation’s most popular website, with the size of nations altered to reflect the number of Internet users there. The map makes for a brief, informative look at how geographic—and universal—certain web tastes and habits are. Facebook, the world’s most popular site, is most popular in North Africa, parts of the Middle East, and the Pacific coast of South America. But elsewhere, Google looms. It’s the most popular website in North America, Europe, and parts of south Asia. Among the 50 countries that have Facebook listed as the most visited visited website, 36 of them have Google as the second most visited, and the remaining 14 countries list YouTube (currently owned by Google). What of the rest of the world? Baidu dominates China, though its spill-over popularity into neighboring countries makes the researchers doubt whether data from those countries is accurate. Yahoo! succeeds in Japan and Taiwan through its nearly two-decade-old partnership with Japanese SoftBank and its 2007 purchase of Wretch, a Taiwanese social networking site. Perhaps most interesting to me are the Palestinian Territories, where a newspaper (a newspaper! ), The Al-Watan Voice, is most popular. But, it may well be that the territories carved out now will have important implications for which companies end up controlling how we communicate and access information for many years to come.